Some of these open space homes are so open that there is not really a foyer. We walk through the door and right into the living room. While some of us may love that idea, others of us prefer to have a transition here. Foyers can be a place to drop our coats, keys, etc. It can be a welcoming preview of what is to come, or it can be a barrier that prevents just anyone from viewing your sanctuary. 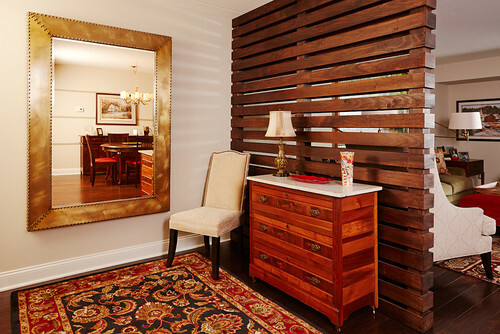 A post and slat wall partition can be a great way to create a foyer feel. 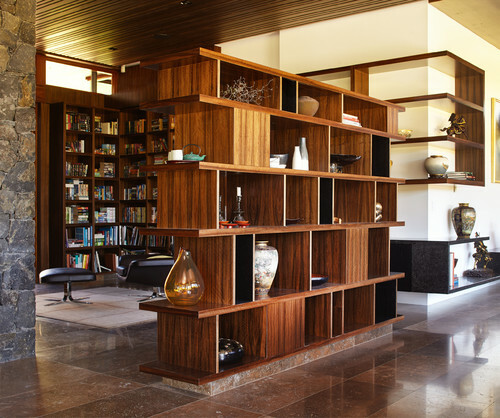 A shelf unit can be a great way to add separation. It doesn’t even have to be closed in on one side. Leave it open and place decor that can be appreciated from both areas. This is a great way to create a dining room area or even an office (as seen above). Similar to the above idea, a traditional home can achieve room division without taking away from the openness by using builtins. In this example, the post and cabinet unit serves as a sideboard for the dining room side but is a bookshelf on the living room side. 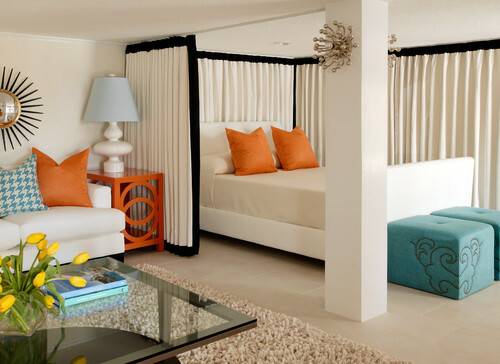 Although I am not a big fan of curtain dividers, I must admit that if done properly they can really add some style. 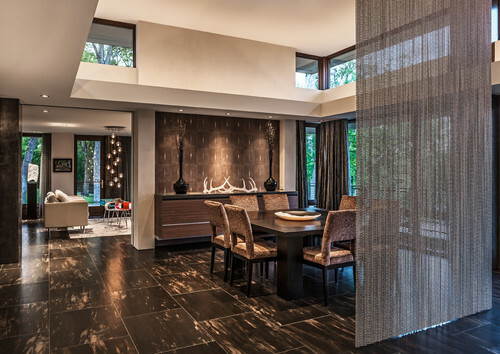 For a contemporary home, a chain panel can fit right in. Something like this would probably work in an industrial design, as well..
Now, here is a fabric divider that I can get on board with. The panels match the wall color and are distinguished only by their black trim. Because the panels wrap completely around the bed, they become part of the bedding while providing separation from the sitting area. It is hung from a ceiling track, and can provide just a partial divide or a completely secluded sleeping area, depending on how far the panels are pulled. 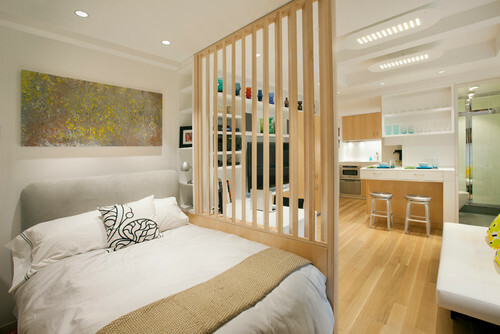 This apartment really needed a way to create a bedroom area. With this slat wall design, the slats are angled so that there is a clear view from the bedroom into the rest of the apartment. However, the bedroom is obscured from those on the living room side. If you have an apartment like this but are not able to install something like this, a good alternative would be to hang vertical blinds. In fact, vertical blinds can be set up to create the illusion of a window. 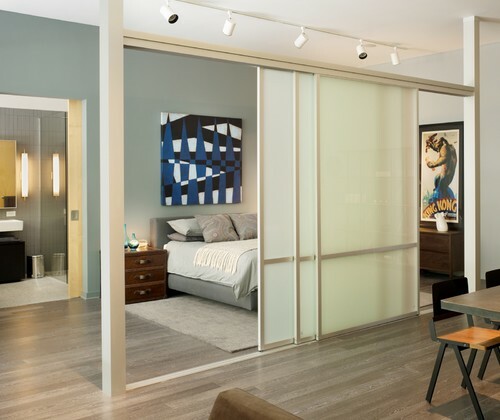 Another good idea is to install sliding doors. They can be anything from heavy solid doors to something light and semi transparent. 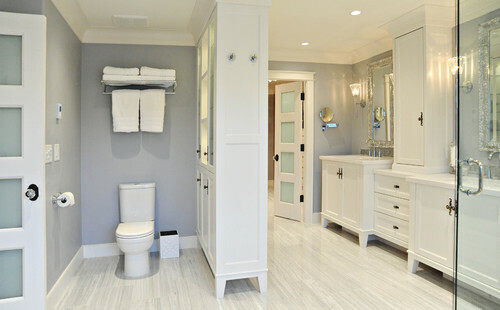 If you have a bathroom that does not have a private area for the toilet, consider a freestanding cabinet and hutch unit. It provides more storage space while creating a semi private space. Note – if you have children in the home, you will want to attach something like this to the wall and ceiling for safety. In fact, I would recommend doing so even if there are no children. Otherwise, just make sure that the unit is stable and not prone to tipping.